The Prep Wife: I'm another black guy! Mr. A and I were talking today about why I am writing this blog. It took me a moment to find an honest answer. I enjoy writing and I am having a lot of fun sharing my little stories and recipes. I read other people's blogs and they always put a smile on my face. If I can make at least one person smile with my blog posts or if one reader can relate to my stories, I'm happy. But is that the only reason? Probably not. As selfish as it may sound (is it selfish? ), I want recognition. I do not want to be the center of attention but I want to be heard. Don't judge me. Don't we all want to be heard? When we were in New York last week, walking down Times Square, we constantly got stopped to buy tour bus tickets, show tickets or the CDs of aspiring rappers. On our first day, we purchased 2 CDs. The following day, as we made our way down the crowded streets, we were stopped again to buy CDs. As we walked by saying that we already purchased some, the guy yelled "I'm another black guy!" He was one of the many, many others who wanted to be heard and who wanted to be recognized. That is who I am also. Just one tiny drop in this world who wants to be heard, who wants to succeed, who wants to be recognized and acknowledged. I have dreams, goals and hopes that go further than my imagination can take me and by writing this blog and by sharing my stories, I feel that I am taking the steps to get to where I want to be. We are all just tiny drops. I have only been blogging for three weeks and have about 900 page views. I do not know if that number is good in a blogger's world (it's probably not great. I see other blogs with hundreds of likes and comments) but it's good for me (for now)! Perhaps some day my audience will grow (hopefully--- please share my page if you like it!) but for now, I feel heard and that makes me happy. Today's recipe is different than the others. 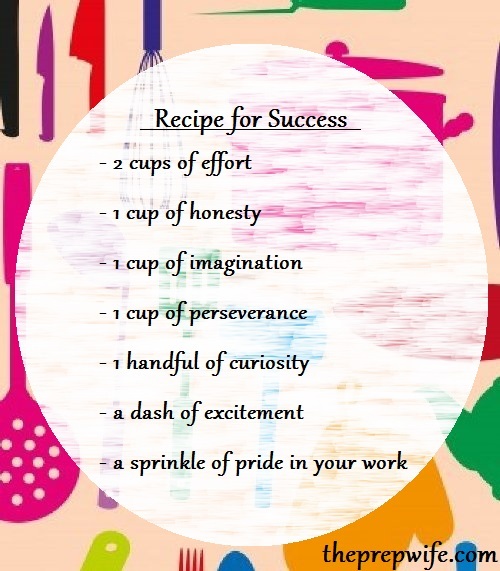 Here is a nice little recipe for success. I find in what I read today a burgeoning writer who can sense and discover the delicate and yet so important spices that enrich our souls, who can touch people and make a change in their feelings by spreading around these subtle delicacies of life.